The American Eagle Platinum Bullion Coin is made from the the world's rarest precious metal, platinum. Available in one ounce, one-half ounce, one-quarter ounce and one-tenth ounce sizes, they carry a face value of $100, $50, $25 and $10 respectively. Of course, these values are only for symbolic and legal tender purposes, but the fact that the one ounce coin shows a monetary worth of $100 (the highest of any coin ever from the US) signifies a much greater assessment. Usually the value of a coin is determined from its limited mintage, rarity, condition and age. However, in the case of these investment bullion coins, the true value is generally based on the market price of the amount of platinum each coin contains. Guaranteed by the US Government for content, weight and .9995 purity, these coins are sought after by those wanting to invest in precious metals. Their price is determined by the platinum content, to which a small premium is added to absorb minting, distribution and marketing costs. In 2009, the US Mint cancelled the production of the bullion Platinum Eagles and only struck the related Proof Platinum Eagle. 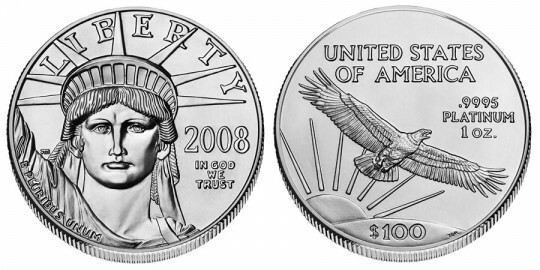 As of 2011, the bullion Eagles have yet to make a return. "Portrait of Liberty" designed by John Mercanti symbolizes Lady Liberty looking toward future on the obverse of the Platinum Bullion coin. The year, "LIBERTY", "E PLURIBUS UNUM" and "IN GOD WE TRUST" are shown as well. Designed by Thomas D. Rogers, the reverse features an eagle, soaring above America with the sun in the background. "UNITED STATES OF AMERICA", "1 OZ. ", "$100" and ".9995 PLATINUM" are also visible.